When it comes to cooking during the week, there are nights when we really don’t want to do anything, when really all we can muster is picking up the phone to dial take-out. We feel badly if we do that too often though, so we came up with this filling recipe that only takes a few minutes and that anyone could tackle, even after a tiring day. 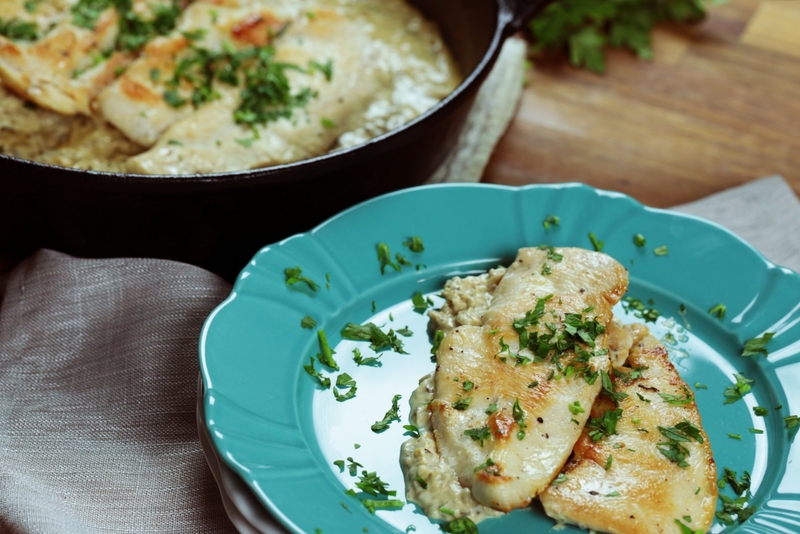 This creamy, herb chicken is really yummy, but the beauty of it is that it’s one package of spreadable cheese that makes up the heart of the dish. Instead of laboring over a finicky cheese sauce, you can melt this one down and be good to go! The flavor’s great – although we added even more herbs to really punch up the flavor – and this finished result goes perfectly with pasta, rice, or veggies. Monday night just got a whole lot better…try it out and see for yourself! Brush chicken breasts with 1 tablespoon olive oil and season generously with salt and pepper. Heat a large pan or skillet over medium-high heat and cook chicken breasts until opaque and no longer pink. Transfer to a plate and set aside. In the same skillet, heat remaining olive oil and sauté shallot and garlic, with basil, oregano and tarragon, for 1-2 minutes, or until fragrant. Stir in herb cheese, broth, lemon juice and zest, and whisk together until smooth, then sprinkle in flour and whisk until incorporated. Cook for 5-10 minutes, or until sauce has thickened. Return chicken to skillet and cook for another 2-3 minutes, or until warmed through. Garnish with fresh herbs and serve hot!